Update September 29, 2017. Added links at the end of this post to related articles at Lathe Trolls. Update November, 2017. Added PC board stuffing diagram for the FMMP-25 layout. Trim pot locations and J6 auxiliary pads changed for driven shield variable gain applications. The Phono Transfer System is a "Swiss Army Knife" flat phono preamp, RIAA equalizer and monitor switcher. Its primary purpose is to provide RAW, flat, un-EQ'd output to a DAW for capture, de-clicking/cleanup, with post clean-up, DSP-based, RIAA EQ. 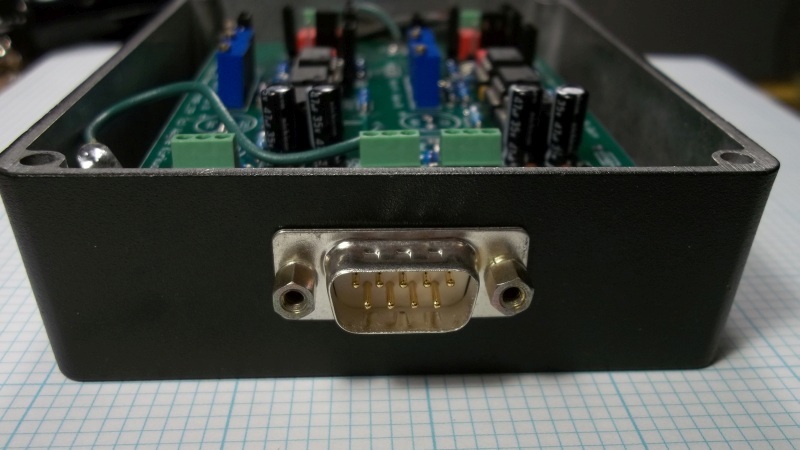 For simple phono playback, the Phono Transfer System can be assembled as a basic high-performance balanced input preamp. 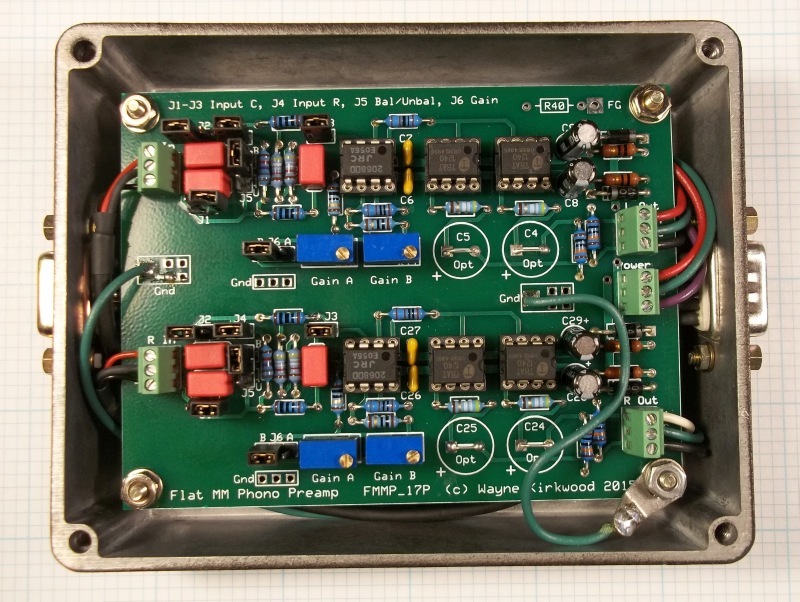 The flat preamp has a fully-balanced instrumentation amp for moving magnet carts. The flat preamp is designed to be remotely-powered and located at the turntable. The preamp's flat, "line level," output feeds a companion dual path record and monitor switcher located at a workstation remotely from the turntable. This arrangement keeps sensitive phono cartridge leads short. An analog RIAA playback circuit is provided for monitoring or EQ'd (not RAW) transfers. A fully configured Phono Transfer System enables the Archivist to simultaneously record RAW and EQ'd files or edit and declick previously-recorded files monitoring through analog RIAA decode. Monitor switching, between the record path and playback path, is non-destructive. Two tasks can be completed at once. Phono Transfer System with remote flat phono preamp and RIAA EQ monitor switcher. Flow diagram for Phono Transfer System with remote flat phono preamp and RIAA EQ monitor switcher. The preamp for the Phono Transfer System is designed to be remotely located at the turntable. Balanced outputs from the preamp feed the RIAA EQ/Monitor Switcher. Phono Transfer System Flat Moving Magnet Preamp FMMP-18 Board Stuffing Guide. Phono Transfer System Flat Moving Magnet Preamp FMMP-25 Board Stuffing Guide. J1, J2, J3 input capacitance. All open - No added load. J1 is 50 pF. J1+J2 is 100 pF. J1+J3 is 150 pF. J1+J2+J3 is 200 pF. J4 is input resistive load. Open is 99.8K, closed can be anything less than 99.8K. With an added load of 88.7K in parallel (J4 closed) the input resistance is "47K" (46.96K). J5 is the input configuration: Balanced or RCA coaxial. When balanced, the input load to ground (common mode) is 49.9K/leg. There are two preamp gain trims for each channel. J6 selects which gain adjustment pot is used. This is for normal gain, typically 5 mV at 5 cm/s, and low gain for very hot, "+12 dB" dub plates. Though it would likely not be quiet enough for MC inputs the jumper could also switch between MM and MC gains. A MC head amp or transformer may also be used with the flat preamp. Someone using the gain mode often would likely make the jumpers a switch or relay. The fully-balanced input is an instrumentation amp having a gain of about +12 to +40 dB. The preamp input is direct-coupled to the cartridge and DC-coupled up to the output. Though op amp bias current flows in the cartridge when connected unbalanced most of the measured data I've seen shows no harmful effects. Connected differentially however, only the offset current difference between op amps flows. It is quite low being in the order of tens of nanoamps. When the cartridge is connected to the input balanced, the output voltage offset is very low. For moving magnet MM cartridges having the typical sensitivity of 5 mV at 5 cm/sec (1kHz) 18-20 dB of gain in this stage is plenty for RAW outputs. 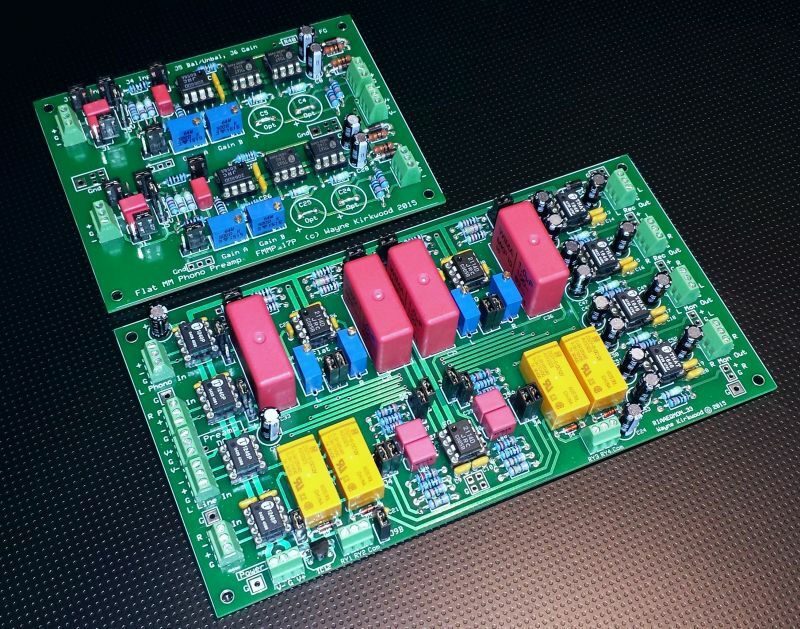 AC Common mode rejection and an additional 6 dB of gain is realized in the Flat Preamp by a THAT1240 double-balanced line receiver. The offset voltage from op amp input bias current - when a differential input cart connection is used - is primarily common mode and rejected by the THAT1240s. For applications where connection lengths are short and balanced outputs are not wanted the second THAT1240 can be omitted. When the companion RIAA EQ Monitor switcher board is used, the output coupling capacitors may be eliminated. 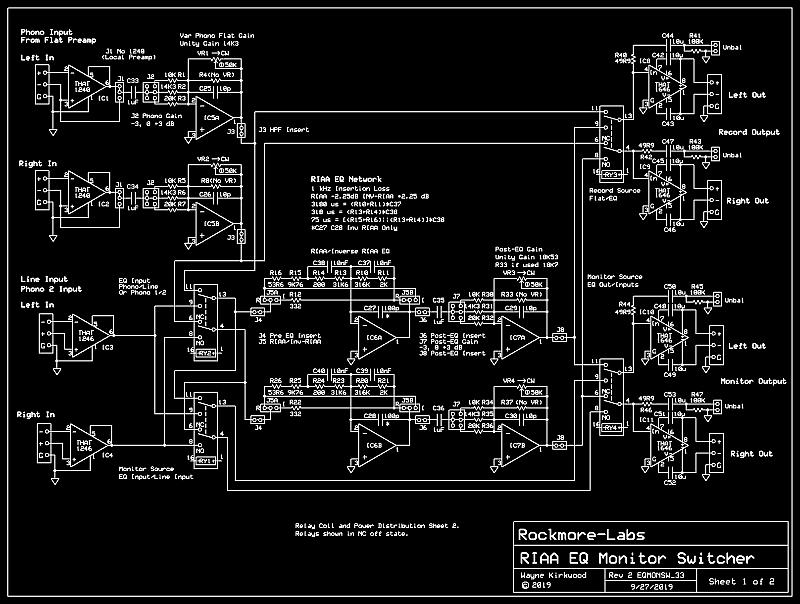 The RIAA EQ/Monitor switcher board has a downstream film interstage coupling cap to strip DC. In free-standing applications, particularly those with high gain and unbalanced coaxial phono connections, output electrolytics may be used. I'm having difficulty making bandwidth-limited noise measurements and have no means to A-weight measurements. The shielded twisted pair balanced DIN tonearm leads are about 3 feet. The line output leads from the flat preamp are 48 feet feeding the RIAA EQ/Monitor protoboard. I had NJM2068s already installed in the flat preamp so I used them. It "sounds" quiet. Scary quiet. I wanted to see what the noise level was when gain was set to produce +4dBu output. The final output has 6 dB gain and the RIAA decoder was set to unity gain. The remainder of the gain, all but 6 dB, was dialed into the preamp. The ATR-96 MM cartridge is rated 5mv at 5 cm/s 1 kHz. They don't specify whether modulation is mono or single-channel. The CBS STR-100 test record I'm using for level set is 3.54 cm/s with one channel modulated. If I'm not mistaken this should work out to be 5 cm/s with both channels driven. Based on that premise, I set the single channel gain to a reference level of +1 dBu. Both channels driven should produce +4 dBu at 5 cm/s (lateral). The RIAA EQ'd (but not A-weighted) output noise with a real cart (not a resistor), sitting on a real turntable, in a real room (with light dimmer EMI not a Faraday cage) produced an output noise floor of about -72 dBu. The signal to noise, unweighted, referenced to +4 dBu is about 76 dB. A 20 kHz equivalent noise bandwidth and A-weighting will produce even better results. AudioTester with a 22 kHz bandwidth is telling me SN should be around 78 to 79 dB. Some of that is hum at Line and 2X, 3X and 5X line. I suspect most of its quietness is from the balanced interface and common mode rejection. The NJM2068 seems to be the quietest performer. The NJM2114 and 5532 were about a dB noisier than the NJM2068. For someone wanting a FET input, the OPA2134 worked pretty well. It was about 3 dB noisier (with a resistive input termination) than the NJM2068. The LME49720 and LME49860 were found to be unacceptable due to burst noise. Maybe I have some bad ones. There is another user on the TI e2e forum with this same problem. I later found that the OPA2134 is actually better with a cart, compared to a resistor, due to its lower current noise. In the midrange the NJM2068, NJM2114 or NE5532 out-perform the OPA2134 where it's higher voltage noise dominates. The Phono Transfer System's EQ/Monitor Switcher is designed for direct connection to the DAW and Monitor Amplifer. The flat phono preamp output can be routed with or without RIAA de-emphasis to separate record and monitor outputs. Output from the DAW is connected to the Line In for playback monitoring. Playback monitoring can be routed to the Monitor Output with or without RIAA de-emphasis. The Line Input can also be routed to the record output with RIAA equalization applied. This permits analog EQ to be applied to flat recordings in situations where DSP-based de-emphasis is not desired. RIAA EQ, Inverse RIAA EQ and Monitor Switcher for the Flat Phono Preamp. Note: The schematic above needs corrections to the relay designators and J9. It will be updated soon to match the PC board layout. Phono Transfer System RIAA EQ Monitor Switcher Board Stuffing Guide. The design has two signal paths. One is for recording the second for confidence monitoring or simultaneous recording and playback. An RIAA EQ section can be placed in either the record path or playback path. Flat transfers can be made through the record path while non-destructively switching monitor modes from monitoring flat record, record with EQ or playback from the DAW output. Having analog RIAA EQ for monitoring saves ears and permits later de-clicking, done in the RAW un-EQ'd domain, to be heard in context. Final EQ of the transfered files is done in DSP. The flat balanced input/balanced output moving magnet preamp can be remotely located and powered from the monitor switcher permitting long cables between the turntable and workstation. The flat/wideband preamp output is received by a THAT1240 line receiver. It is then AC-coupled into a variable gain inverting buffer. Relay RY3 selects either flat or RIAA EQ recording mode. RY2 must also be in Phono. The operation of RY3 is destructive to recording. The operation of RY2 is non-destructive to flat recordings. The record out is available as an RCA connection or fully-balanced by a THAT1646. The RIAA EQ section can be switched between the Record and Playback Monitor paths by RY2. A post-EQ gain stage can be used to provide stepped gain trim and additional post-EQ gain if needed. The DAW playback output is fed into the THAT1246-based line receiver. RY3 selects either Flat or EQ'd monitoring from either the Play line input, Preamp Output or RIAA EQ output. The operation of RY3 is non-destructive to recording. RY1 switches the flat monitor source to either follow the RIAA EQ or the Line Input. J1 bypasses the balanced input stage. This is used when the flat preamp is in the same chassis as the EQ/Monitor Switcher. When J1 is connected directly to the input, the THAT1240 on the EQ board and one THAT1240 on the flat preamp may be removed. J2 (optional) permits the preamp gain to be raised or lowered in 3dB steps. It can also be a front panel switch. J3 is a rumble/warp filter insert. J5A/J5B switch the RIAA filter to inverse RIAA to permit the board to be used for cutting discs. J6 is an optional cartridge correction filter insert point. J6 may also be used to provide a return for alternate EQ. J7 permits the post-EQ gain to be switched in 3 dB steps. J7 can also be used to sum cutterhead feedback with modulation. J8 is a second playback cartridge correction filter insert. J8 can also be used for additional cutterhead EQ. J9 selects relay power and ground from an on-board 12V regulator or external sources. There are lots of them but these are the highlights. The preamp gain can have an optional trim pot to adjust flat gain. Gain is typically trimmed in the flat moving magnet preamp. For moving coil preamps, fine adjustment of gain is not always possible. A trim in this location allows minor amounts of "helper" preamp gain and adjustment of channel balance for moving coil carts. If the flat preamp is located with the EQ/Monitor switcher the THAT1240 balanced input is not required. The flat preamp can have one THAT1240 removed. Due to signal inversion, the inverting output of the flat preamp and inverting input of the EQ board are used to maintain correct polarity. This is also the reason the THAT1240 appears "upside down" with the + input connected to the - THAT1240 input. For applications which do not require post-EQ gain trim it may be eliminated. More construction information will be posted here as it becomes available. The Flat Phono Preamp fits nicely in a Hammond 1590BBBK enclosure. Paul suggested using 9 Pin D connectors to minimize panel space and it worked out nicely. The preamp is designed to be remotely located at the turntable. The Hammond 1590BB is 4.7" x 3.7" x 1.3" and is easily tucked away behind the turntable. Balanced Input/Balanced Output Moving Magnet Flat Phono Preamp part of the Phono Transfer System. The board sits above the D connectors on 5/8" spacers. The metal case is tied directly to DC ground. The turntable frame ground has it's own DB-9 pin which also ties to DC ground. I found that a 100R resistor (R40) from DC ground to the frame works just as well. The output coupling capacitors will not fit in the box but they really aren't needed. The typical differential and common mode output offsets are in the millivolt range thanks to the balanced cart connection and common mode rejection stage. 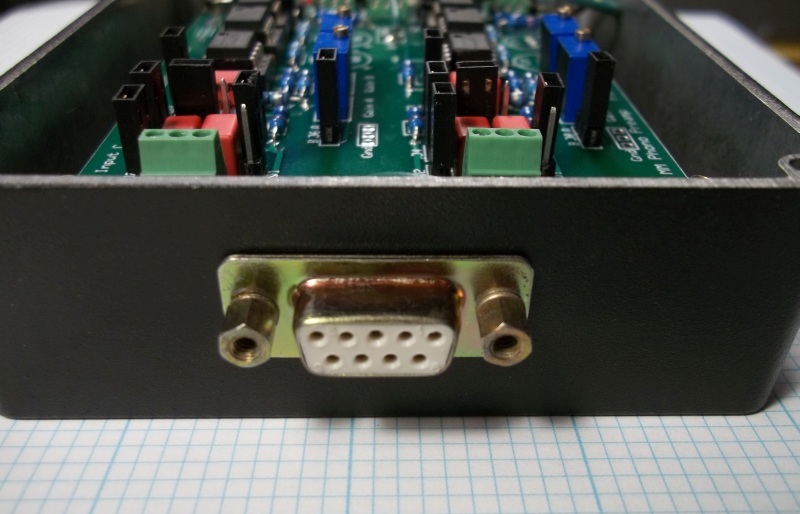 The balanced phono inputs are on a female DB-9 connector. The back shell is internally shielded with aluminum foil. It's important the the DB-9 frame is grounded (or AC grounded) because there is about 1.5 pF capacitance from the frame to the pins. After I took this pick I realized that the color codes for the outputs were reversed. So I reversed them and the inputs. The flat balanced preamp outputs and bipolar DC power input are on a DB-9 male. The DB-9s are pinned out so that DC will not appear on the cartridge if one were to absently-minded plug the input and output cables together. At the present time the Flat Preamp is driving the RIAA EQ/Monitor Switcher through 50 feet of cable. The balanced low-level cartridge cables are less than 3 feet long. There is a lot of benefit to the balanced input connection and local gain. Wayne was kind enough to send me assembled and tested PCB's to build a Phono Transfer System. This is like a dream come true for me. I've always wanted something like this. My needs are different than Wayne's so I built it up a bit different. My primary use is to interface with a lathe for playback. It's difficult to interface a phono pre to a Neumann lathe because the 0V bus is very polluted with current from pull down transistor switching. The audio electronics are almost totally separate. I also wanted my build to be able to stand up to torture tests. It should be impossible to make noisy. Even on a stage at 4AM with bad grounding, heinous dimmer noise and a drunk stage hand. I went to great lengths to make sure this happened. I used an ABS plastic case and lined it with copper tape. I wanted to make it impossible for the remote pre to come in contact with any ground plane. You can see the nylon shoulder washers I used so the mounting screws don't touch the shielding. Here is part of the grounding scheme. The binding post is DC coupled but the cable shield and cover are AC coupled. Here is the pre wired up. The umbilical cable runs Audio Common separate from Chassis. They meet at the service entrance. Here is a shot of the system. Getting there. Since I am primarily using this for monitoring and don't record much I wanted it to behave differently than Wayne. Here is the faceplate, which will be redone. Instead of "Record" and "Monitor" paths like Wayne I am calling the two paths "Phono" and "Line". The "Record Out" I'm calling "Phono Out" and the "Monitor Out" I'm calling "LIne Out". I have RY1 and RY2 tied together on the same switch. If RY1 is in "Play" (Line) then RY2 is in "EQ". In other words the left most switch switches the EQ from "Phono" to "Line". If the EQ is in the Phono path then "Line" path is flat. I have RY3 on a switch. I would generally use the "Line Out" as a buffered record out if I need it. That way I can switch the EQ in and out of the Line or Record out. I also will alter the gain at the trim in the Base Station. The rotary switch will have -12dB, -6dB, 0dB, +6dB,+12dB. The fine trims will be +/-6dB. So there will be 18dB of gain at the finger tips. Good work guys. I am tempted. Your bench looks about like mine! Thanks very much Paul for all the hard work you've put into this. It's very nice to see SN002 sitting on the back of a lathe. Thanks. It's going to be very flexible. I realized that with a 1:32 step up the Denon 103 wants to see a 100k load which is already there. I was using 1:16 before. I was going to use a second set of transformers for the SPU. Now all I have to do to change over to the SPU is put the right value parallel resistor in R1 and move the jumper and use Gain B. If I want o use an MM I can move the leads from the transformer input to the PCB input. Pretty slick. I did some more work on the gain switching I want. I set it up with the gain range I wanted and the fine trim. +/- 6dB wasn't a fine enough resolution for me so I tried +/- 3dB. Still no good. I am using this primarily for reference listening so I want it calibrated within 0.1dB. Time to ditch the fine trim idea. Since I have 12 position switches I decided to go for +/- 18db. -18,-12,-9,-6,-3,0+3,+6,+9,+12,+18. After spending some quality time with a resistor substitution box I decided against going to +18dB. The feedback resistor would have had to be 300k which seemed a bit much to me. So +/- 12dB it is. Unfortunately when I got through with everything I realized I got the range wrong. Now it goes from -18dB - +9dB. Ooops. I'll fix that eventually and publish my values. The switch wiring is how I want it. I decided to dump the switch for RIAA Encode/Decode. It would be a rare use and running wires around might be counter productive. I can move the jumpers if I ever need it. I have RY2 and RY3 tied together. When RY2 is NC RY3 is NO and the other way round. That switch is called RIAA EQ and it chooses Phono/Line. RY4 is the Line Out choosing EQ or flat. RY1 stays NC so no connection necessary. Here is a shot of it calibrated using the AP Portable One as the signal source. It has the 1:32 step up transformer at the input. I have an intermittent 3dB noise floor discrepancy between the channels. Of course when I went to take the photo it wouldn't go away. Last edited by Gold on Sun Sep 20, 2015 7:53 pm, edited 3 times in total. Paul - You might want to cut the wire ties bundling the left channel gain switch to the right channel input leads and re-route the left gain switch separately. That might be introducing a capacitive imbalance in either the right channel input or left channel front-end. I had one channel that also had more hum ingress depending on arm position with the AT-96. It was quiet on or over the platter but had a slight rise when on the tonearm rest. The AT-96 does not have an external grounding strap but it sure acted like it had an internal one. Upgrading to the Stanton 681 moved the hum to the other channel - removing the grounding strap made them both equally quiet. When I ran that experiment previously it was with the aforementioned AT-96 having the reference NJM2068 in the left channel and the DUT in the right. So there may have not been a noise disadvantage for the OPA2134. Not originally knowing the AT-96 had some imbalance and now having the benefit of the preamp being in a sealed metal box I should retest. mediatechnology wrote: Paul - You might want to cut the wire ties bundling the left channel gain switch to the right channel input leads and re-route the left gain switch separately. That might be introducing a capacitive imbalance in either the right channel input or left channel front-end. The imbalance was there before I put in the switch. I thought I had got rid of it. It was at the input. I redid that wiring. I suppose it could have switched places. I didn't try to chase it down yesterday as I was concentrating on resistor switch values.